Below you can view all the homes for sale in the Sierra Vista subdivision located in Arvada Colorado. 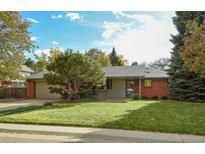 Listings in Sierra Vista are updated daily from data we receive from the Denver multiple listing service. To learn more about any of these homes or to receive custom notifications when a new property is listed for sale in Sierra Vista, give us a call at 720-580-6756. Over sized garage plus workshop The walkout basement could easily be a mother in law space, or? ? MLS#5250643. MB SON & SEA REALTY LLC. Check out the schools, newly built Sierra Elementary & feeds into Ralston Valley High. Sewer line new 2015. MLS#6014434. RE/MAX PROFESSIONALS. Enjoy viewing this stunning home, inside and out! MLS#8842642. RE/MAX ALLIANCE.